Navigate the CBC's interactive map for the full wildfire picture across B.C. The B.C. Wildfire Service is continuing to fight numerous wildfires across the province while expecting some new fire starts as a result of the high fire danger rating, combined with heat and lightning in the forecast. Though nearby wildfires are still wreaking havoc on the area, boaters on B.C. 's Okanagan Lake continue to enjoy the best of a B.C. summer — and that's causing problems for firefighters working in the area. Glen Burgess of the B.C. 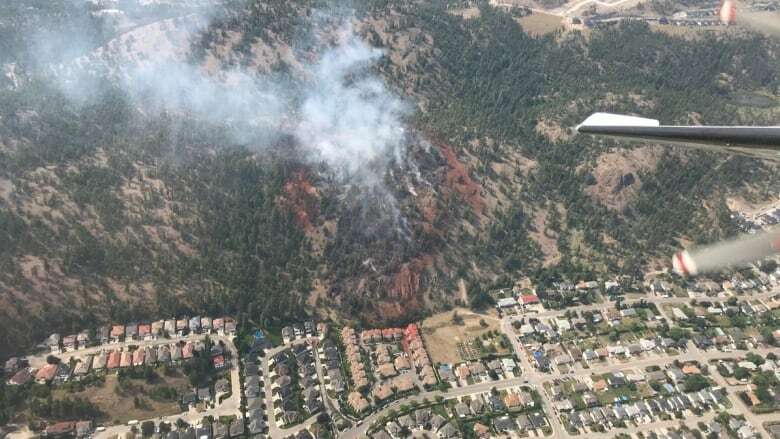 Wildfire Service said the boaters are impeding the response of firefighters' support aircraft, which use the lake as a bucketing tool and water source. The wildfire in Okanagan Mountain Provincial Park has grown to nearly 14 square kilometres and is classified as out of control by the B.C. Wildfire Service. A fire in Kelowna, near Yates Road, is considered "held." The evacuation alert for over 900 properties in the Glenmore area of Kelowna has been lifted. Crews believe the fire is not likely to spread beyond the existing boundaries in the current weather conditions. The Regional District of Okanagan-Similkameen Emergency Operations Centre (RDOS EOC) is issuing an evacuation alert for two properties due to the threat of the Snowy Mountain protected area wildfire, and for one property at Cathedral Lakes Lodge due to the threat of the Placer Mountain wildfire. In Metro Vancouver, a fire near the Richmond Nature Park is now at 10 to 12 hectares. Nearly 60 firefighters — including members from B.C. 's Wildfire Service — have been battling the fire for three days, although Richmond Fire Rescue Deputy Chief Kevin Gray says progress is being made to contain it. An air quality advisory remains in place for eastern parts of Metro Vancouver and the Fraser Valley — specifically Maple Ridge, Langley, Pitt Meadows and eastern parts of Surrey — due to ground-level ozone and haze from wildfire smoke. The B.C. Wildfire Service is also responding to a new 291-hectare fire near Fraser Lake in Northern B.C. It says smoke is highly visible throughout the Fraser Lake area and from the B.C. Highway 16 corridor. The Mount Eneas, Goode's Creek and Glenfir Road fires are still active, although held. The B.C. Wildfire Service issued a warning reminding the public to stay away from the areas.